An innovative, esoteric synth that's still easy to use and quick, Factory is one that sound designers and modulation nuts will love. No numerical mod depth display. Sugar Bytes' new synth is a semimodular beast that embodies the company's unorthodox approach to plugin design and puts deep modulation at the top of the feature list. Far from your standard virtual analogue fare, Factory's (VST/AU/AAX/Standalone) two identical main oscillators offer a selection of ten wave-generating models, each populating the panel underneath the selection menu with its own knobs and menus. 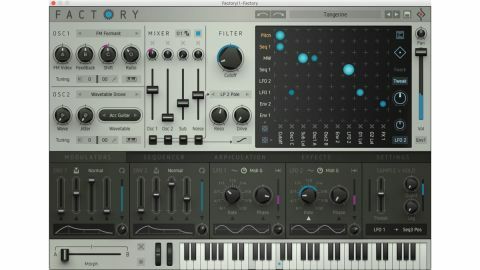 The models range from synced square and saw stacks to phase mod, granular sampling and wavetable engines (PWM, Sync, Formant and Drone), and between them deliver an extraordinary array of highly editable raw tones, with the straightforward controls positively inviting real-time manipulation and modulation. The main oscillators are supplemented by a sub oscillator (sine or square wave, tracking either main oscillator or ring modulating the two), and a noise oscillator with five colour options. All four oscillators are independently routable to a resonant filter (11 modes, including 2-, 4- and 8-pole low-pass, Midboost, Comb and Vowel) and plumbed through a Drive module with Tube, Diode and Sine algorithms, and an optional high-quality mode. Factory's oscillators are vibrant and spectacular enough on their own, but the beating heart of this instrument is the modulation section. Eight source slots can be loaded to output any of Factory's Modulators (see below), the usual line-up of MIDI signals and the levels of all four oscillators, while ten target slots enable modulation of all oscillator and effects controls, the filter, sequencer tempo and much more. Having chosen your source and target using the menus on the X and Y axes of the matrix, dragging up and down on the square at which they intersect raises and lowers the modulation depth, as indicated by an expanding/shrinking coloured dot - blue for positive modulation, pink for negative. While we do appreciate the graphical approach taken here, we'd like the option to swap the dots for regular numerical read-outs added. Visual feedback on each assignment is given via an animated collar or strip around or alongside the target control in the main GUI, and modulation depths are modulatable, too, in the excruciatingly titled Twerk section, with its Tweak/Mutate/Target knob. In Tweak mode, the knob adjusts all modulation depths in the matrix collectively, and applies a 'via' mod source selected from an extensive menu of signals (various MIDI, all of Factory's Modulators and Audio Out) to them. As you might expect, Factory is most at home making the kinds of highly mobilised, animated noises that only a synth with this level of modulation flexibility can. Mutate mode does the same but with a degree of randomisation. And in Target mode, the via mod source is shuttled through the matrix using a knob, letting you shift the via modulation around between assignments in real time - odd, but kind of cool. The mod matrix can be randomised in two ways. Clicking the die button at the end of the source or target row/column randomises the contents of the slots in that row/column, while dragging on the larger die icon, top right, progressively adds more randomised modulation depth dots to the matrix the higher it's raised. Factory's two ADSR envelopes, two LFOs and sample and hold module are housed in the Modulators tab. The LFOs work in mono or polyphonic modes, while the S+H module features separate input signals for the trigger and sample source, opening it up to all sorts of complex burblings. Factory is no slouch in the effects department, either, with three freely reorderable insert slots hosting a selection of 17 modules - reverbs, delays, filters, phaser, chorus, and more. Every effect has a concise but transformative bank of up to four controls, and they all sound great, as you'd expect from the creators of the fabulous Turnado. All of their parameters can be modulated, too, as mentioned, although you can only target each effect as a single unit, turning modulation on or off for each of its parameters, rather than discretely pointing, say, an LFO and an envelope at two separate knobs in the one effect. Finally, Factory's Morph fader enables interpolation between two complete parameter states, and is assignable to a MIDI controller for even more internal movement. The enormous preset library uses a deep and informative tagging system, and does a superb job of showcasing what the synth is capable of. Highlights are the well thought-out oscillator models, the intuitive modulation matrix, the sequencer and the effects, but everything here comes together brilliantly in an instrument that's surprisingly easy to use - given how complicated it invariably sounds - and a whole lot of fun. While we wouldn't recommend it as the first choice for anyone seeking a general purpose workhorse synth to cover all the basics, for enormous, weird, heavily modulated and rhythmic sounds of all kinds, it's a winner, with a character all its own.